Abhinaya is a mafic wand in the hands of 'Padmabhushan'Smt. Kalanidhi Narayanan and she waves it this time to describe navarasas, the nine basic emotions as experienced by Shakthi, the divine consort of Shiva. In an engaging classroom session with Priyadarsini Govind, her illustrious disciple and the eminent danseuse, Kalanidhi 'maami' unveils the gamut of emotions kindled in Shakthi by the adventures and attributes of Shiva. Shakthi is 'shrungara' personified when she sets her eyes on Shiva; all other men create 'bibatsa'; She shows 'raudra' when she thinks of Ganga, the 'other' woman in her life; hearing Shiva's exploits, she displays 'adbutha'; she exudes 'bhayanaka' stirred by the snakes encircling Shiva's body; she is an embodiment of feminine valour or 'veera'; she is all 'haasya' in the company of her man Shiva. She does this in style by making use of a slokam by Adi Sankara- 'Shive shrungarartra' in ragamalika..
What follows the classroom session is a sprightly demonstration of 'Shive shrungarartra' by Priyadarsini Govind. 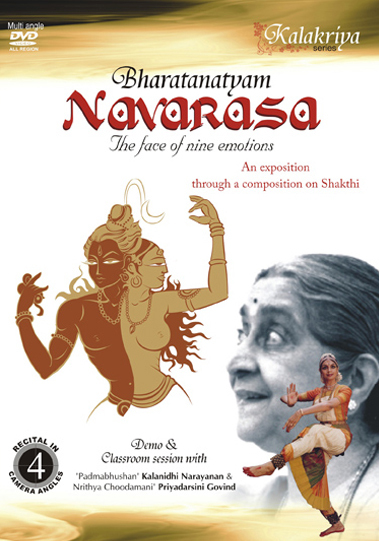 A treat to the true lovers and learners of Bharatanatyam!